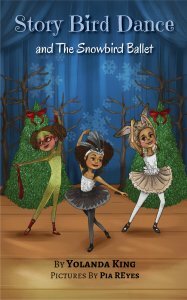 I’m so in love with the cover of the newest book, Story Bird Dance and The Snowbird Ballet and the mini ballet. I wanted to incorporate black, grays and whites in the Snowbirds ballet costume. So often the main character is in all white. I wanted drama and my illustrator delivered! She rocks!!! I sent her a picture of an actual bird because the colors inspired me along with a possible costume and she produced a work of art for the dancers. The entire story is about the two of the dancers, Nia and Jada facing some fears around the performance. A back story includes a mini Modern Ballet story I wrote (as Ms. Kenya, the students dance teacher). My family has been a total trooper as I kept running ideas by them. The ballet is about a Snowbird that flies from her snowy home and crosses a dessert to lay her diamond eggs once a year. She says goodbye to her friends the Arctic Hares (for some reason I leave out the first “c”) Polar Bears and the Forget Me Not Fairies. She has to pass the Lizard King and give him one of her diamond eggs. This year the Lizard King decides to imprison the Snowbird. I love it!